The i.MX RT1060 is the latest addition to the industry’s first crossover processor series and expands the i.MX RT series to three scalable families. 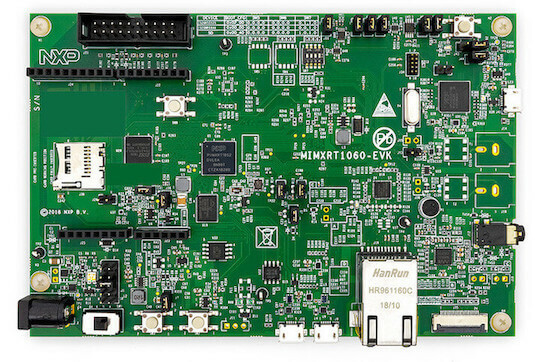 The MIMXRT1060 SoC has five pairs of pinmux/gpio controllers. The MIMXRT1060 SoC is configured to use the 24 MHz external oscillator on the board with the on-chip PLL to generate a 600 MHz core clock. The MIMXRT1060 SoC has eight UARTs. LPUART1 is configured for the console, LPUART3 for the Bluetooth Host Controller Interface (BT HCI), and the remaining are not used.